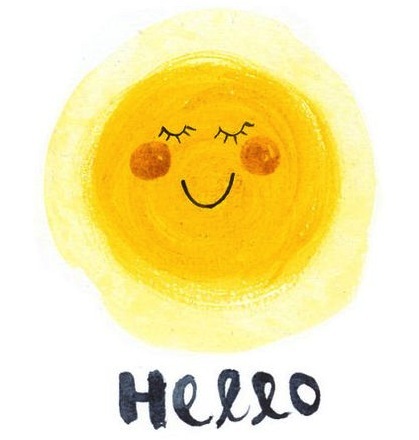 Welcome back, fellow readers! 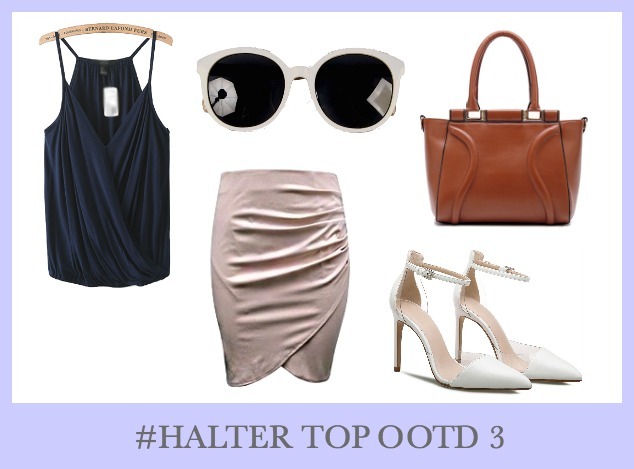 Today’s topic is all about HALTER TOPS! As the days get warmer, we tend to show off more skins by wearing those barely-there clothing. Maybe you are thinking about crop tops, off shoulders and tank tops, but summer is not just about these! Halter tops can be perfect to show off your shoulders and arms in these warm sunny days. Halter top was one of the most iconic fashion pieces in the ’90s and I am pretty sure you’ve seen a lot of movie stars / pop stars wearing those. Today, the halter top trend is coming back with some updated design and I’m pretty excited to share you some styling tips on how to wear a halter top. So ladies, it’s time to channel some up-to-date ’90s vibes with our styling tips to create a perfect halter top look! 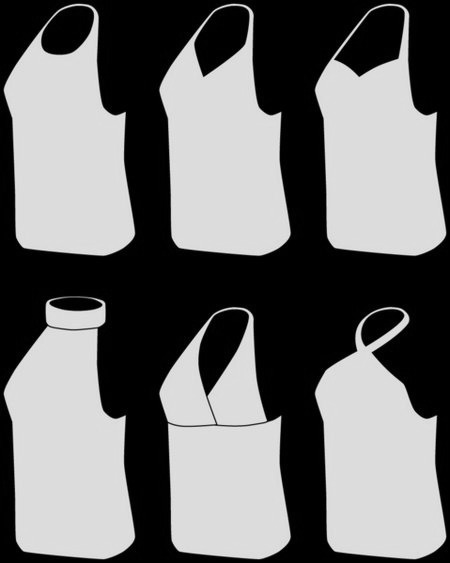 If you haven’t heard of halter tops, these are the various styles of halter top attire. 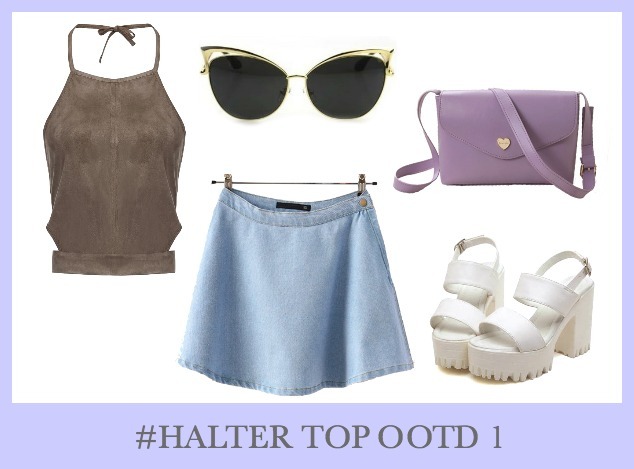 For the first OOTD, I have hand-picked a brown color faux suede halter top and pair it with a light blue denim skirt. Whatever bottoms you are choosing, go with light blue color because brown and light blue colors go well together. 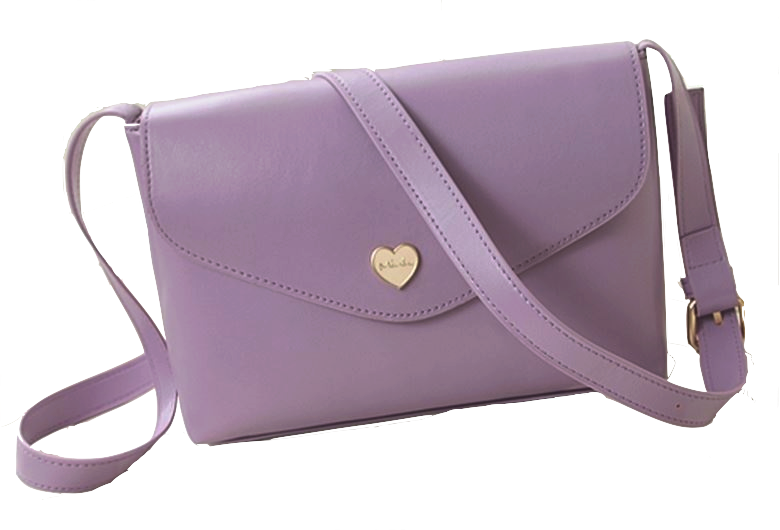 For the handbag, I have picked a lavender color shoulder bag with a heart shaped button on it. Choose a pair of stylish all-white platform sandals to make yourself look tall and have slimmer legs. Lastly, a pair of edgy cat-eye sunglasses is what you need to look extra cool. 2) RED, WHITE, BLUE & YOU. For the second look, I have decided to go with a more classic 4th of July style. 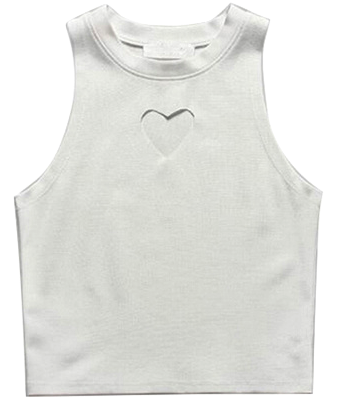 This halter top with heart cut-out detail on it is seriously a deal because it is so cute! 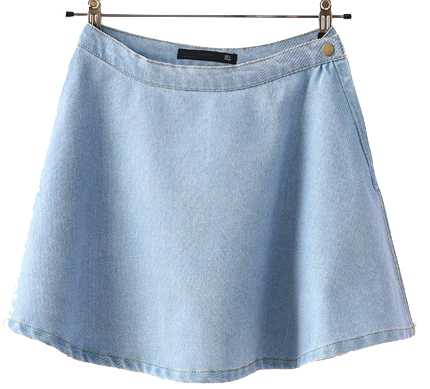 Pair it with a boyfriend denim jeans to create that casual and simple look. 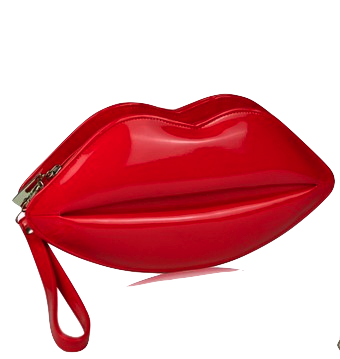 For the bag, I have chosen this sassy red lips purse because it is so fun and flirty! Next, put on a pair of heart-shaped sunglasses for that extra bit of sassiness. Lastly, a black suede lace-up flats is all you need to complete the summer look. 3) Work work work work work. Coming to the third #ootd, this outfit is about how to wear a halter top at work. So working ladies, this is made for you! Opt for a piece of navy color halter top and pair it with a cream color pencil skirt. Slip on a pair of trendy white ankle strap pointy heels and carry a brown leather handbag for that elegant and professional look. If the sun is too glaring outside, put on a pair of round frame sunglasses to prevent harmful UV rays from hurting your eyes. 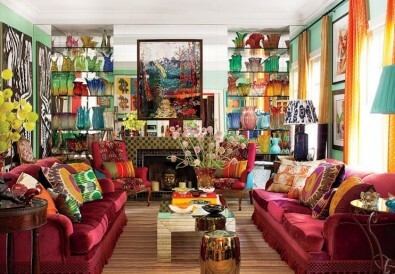 And voila – fabulous and chic! Tips: If you want to look more professional, throw on your fave blazer to add warmth and sophistication to your outfit! 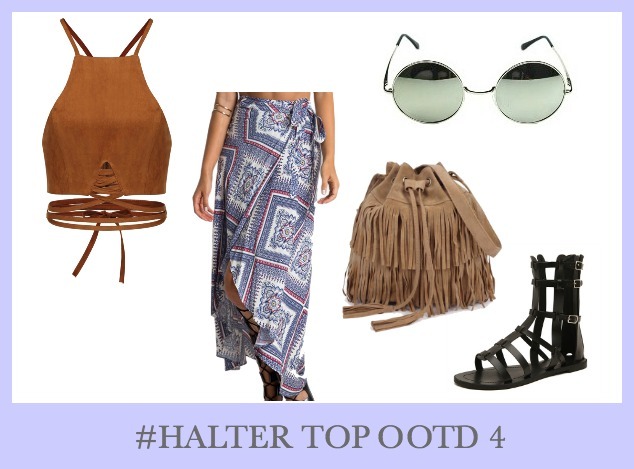 Another way to style halter tops – go boho! Channel your inner boho vibes with this bandage vest halter top. For the bottom, opt for an ethnic print maxi wrap skirt, they are so flowy and comfy to wear in! Carry a tassel drawstring bucket bag and step out in this black gladiator sandals for that ultra-bohemian look. Add an extra bit of vintage style to your outfit with a pair of retro round frame sunglasses. And that’s it! Definitely a go-for outfit in this summer festival season! Well, you’re not really going to have breakfast in this outfit anyway. For the fifth halter top style, this outfit idea will take you from an evening dinner party to a fancy dinner date with your significant other. Choose a blush pink halter top and style it with a black flare skirt with a bow knot detail on it. Wear a pair of burgundy pointy heels to add some color contrast to your outfit. Carry a pearlstone clutch for that extra elegant and classy look. Lastly, add a finishing touch to your outfit with a stone necklace. Tips: Add a pair of silk gloves if you wanna feel like a royalty! For the last halter tops styling tip, let’s go rugged with a bomber jacket! Tone down the masculinity by pairing down the bomber jacket with a feminine cropped halter top. 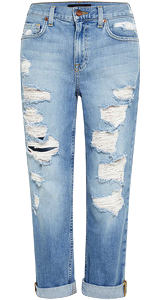 Put on a pair of dark color ripped jeans to create that rugged look. Then, wear a pair of burgundy boots to match with your outfit. Lastly, a pair of aviator sunglasses will make your outfit cooler than ever! 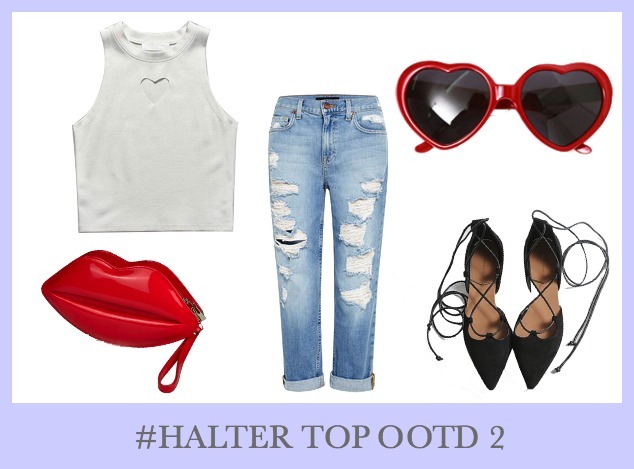 That’s it for today’s topic on How to Style Halter Tops! 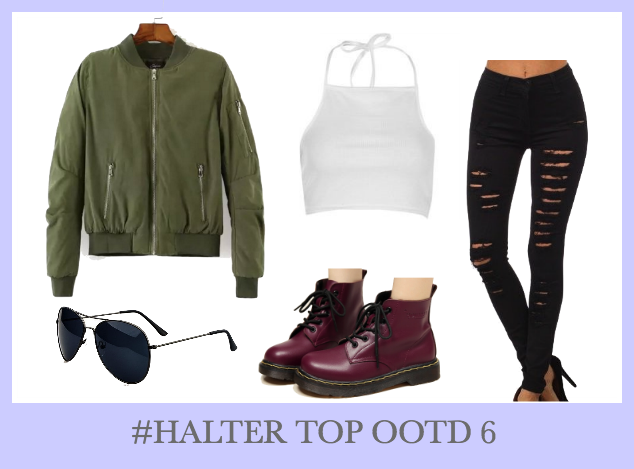 Halter tops are pretty versatile and can be styled in different ways. I hope you girls have fun and don’t be afraid to experiment around with different styles. If you have more creative ways of styling halter tops, please don’t hesitate to drop a comment and share your ideas with us! 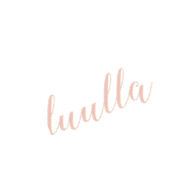 Whatever you’re looking for, you will find the right piece of halter tops here in Luulla.